Now, many of you may know that I work for a book importer and distributor, and that we represent many overseas publishers. So, having said that, the majority of the books we bring in do have a distinctly American or British feel. Having said that, however, from time to time, there comes along a book that is actually by an Australian author, or has an Australian contributor. 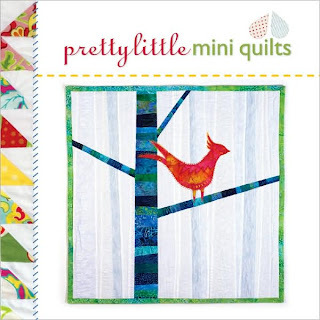 Pretty Little Mini Quilts is just such a book. Louise is giving one lucky reader a copy of this fabulous little book, and I really do think you should pop on over and check out her blog and enter the draw. All you have to do is leave a comment and say hi! You've only got until this Sunday, the 21st March, to enter, so hop to it! Louise has posted some internal pics of the book so you can see some of the cute designs contained between the covers! P.S. If you're not lucky enough to win but would still love to get your hands on a copy, you can pre-order your copy now (stock arrives next week!) from Booktopia here, or you can send an enquiry through to Can Do Books here, and they will put you down for one when stock arrives. Alternatively you can order a copy through your local Dymocks or Angus & Robertson store.